March's kit "Strawberry Fields" is on sale now at Scrap For A Cure. Oh boy, is this a cute one!!! It includes pieces of the ever popular Dear Lizzy line from AC, Cosmo Cricket's Garden Variety and lots of Jenni Bowlin. And of course lots of embellies from My Mind's Eye, Maya Road and My Little Shoebox. Caaaa-ute! Take a look at the site for more detailed pictures of the kit. I only have one LO ready to reveal but more are in the works. In the meantime you might want to go get yours now. I have a feeling this one will be sold out quick. Love this layout! 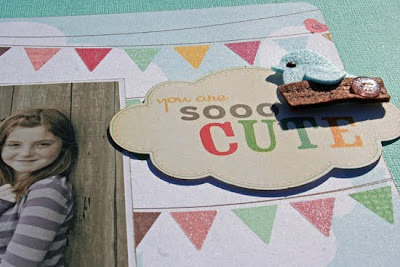 I am off to check out the kit on the Scrap for a Cure blog. It looks delicious! Oh wait I just saw it!! Congrats on the guest Dt at Paper Poppy! I am sooooo jealous!! Aphra's kits are going to be to die for!! Love your darling LOs!! 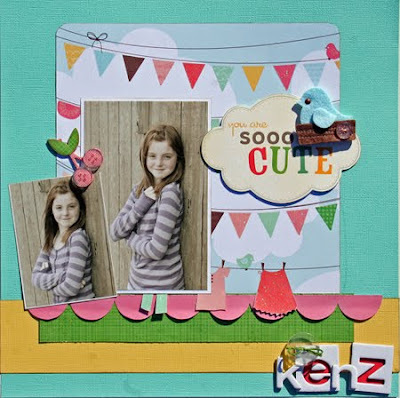 Fab kit papers! Loving this page!!! That is one awesome kit indeed! She certainly IS a cutie! And those papers are wonderful! Thanks for giving us a chance to win here!